Tomorrow, Nov. 8, 2017, will mark the one-year anniversary of the election of President Donald J. Trump. To some on the left, the devastation surrounding this divisive and monumental election might seem unique in the history of American politics. 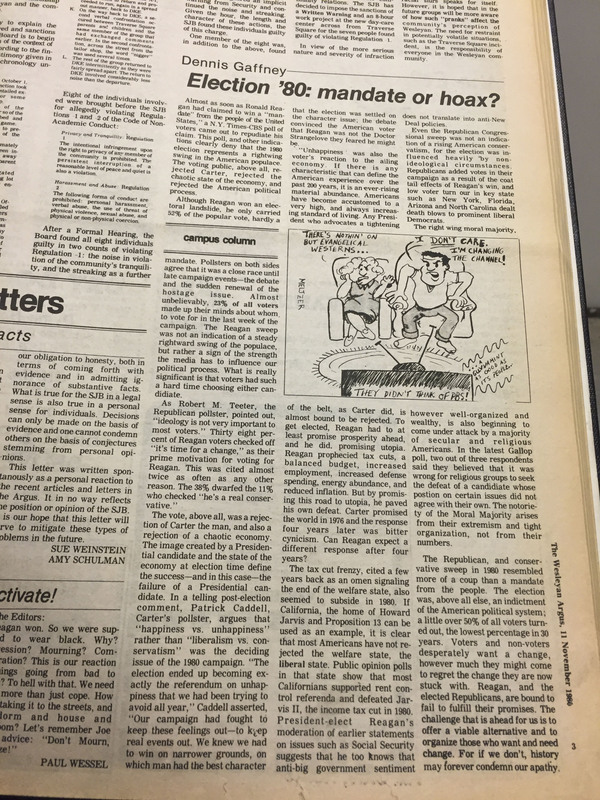 Further investigation into The Argives, however, reveals an eerie mirroring of the Nov. 7, 1980, issue. Despite evident similarities in response to their elections, there are critical differences between Reagan’s and Trump’s platforms. One important detail distinguishes Reagan’s win from Trump’s: Trump lost the popular vote by nearly three million votes, while Reagan’s win was a landslide. The Gipper garnered eight million more votes than his opponent in the popular vote, taking the electoral college in a stunning 489 to 49 victory. In a few instances, the shock from University students in 2016 revolved around the perceived brokenness of the electoral college system that permitted Trump’s victory. Beyond the concerns voiced about what a Reagan and Trump presidency might mean, there were distinct parallels in campus actions in the days following the elections. 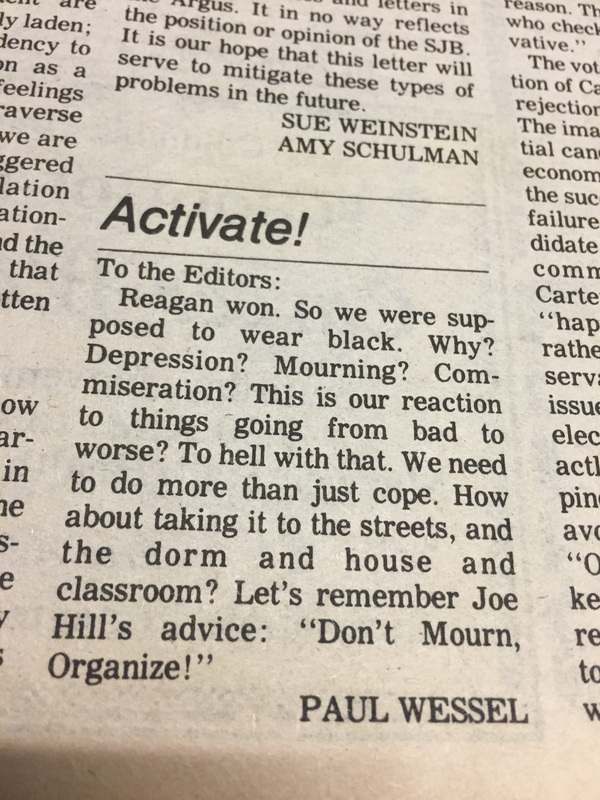 1980’s Communal Moan on Foss Hill echoes 2016’s “group scream.” The controversy surrounding the burning of an effigy of Reagan links definitively with the defacement of a flag on the steps of Olin last year. 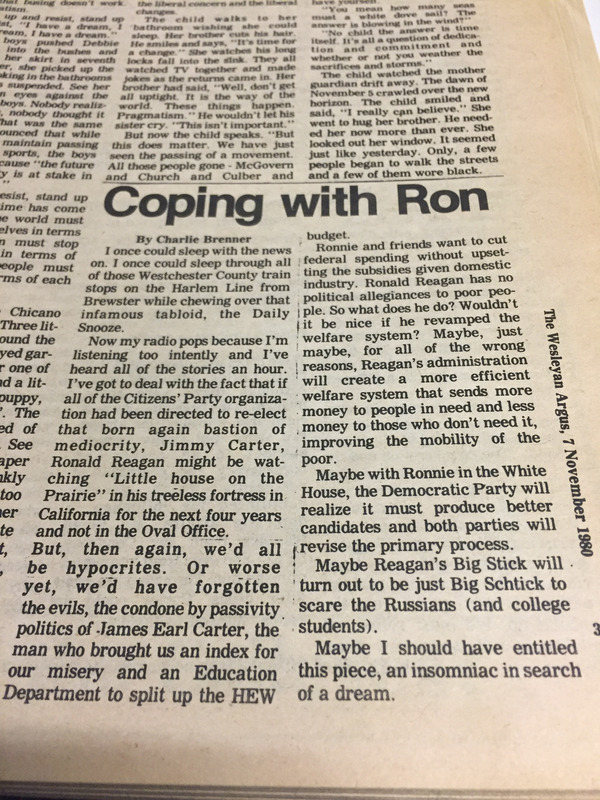 (A letter to the editor from 1980 titled “Poor losers” spoke out strongly against the burning Reagan effigy and now reads as chillingly similar to the language that has been often used by Trump). Fears of apathy and complacency during the 1980 and 2016 election cycles saturated Reagan- and Trump-focused Argus articles. 1980s pieces brought up many of the same hopes and calls to action that students highlighted after business mogul Trump became President-elect a year ago. Following last year’s campaign, Saam N.J. ’20 wrote a thoughtful opinion piece about his grandfather immigrating to the United States from Iran. Paul Wessel’s ’82 Letter to the Editor delivered a similar line of determination. Calls to action abound in pieces from both eras, urging students to combat change that the then-president-elects intended to bring about. “Do not be idle—Resist,” Devonaire Ortiz ’18 concluded in his four-part essay for the Voices section on Trump’s election. A clear difference between The Argus’ coverage of Reagan’s and Trump’s electoral victories is the explicit discussion of race after 2016’s election, which is notably missing from 1980s pieces. Contributors like N.J., who wrote a personal piece about race and Trump, brought that key factor to the forefront of discussion. 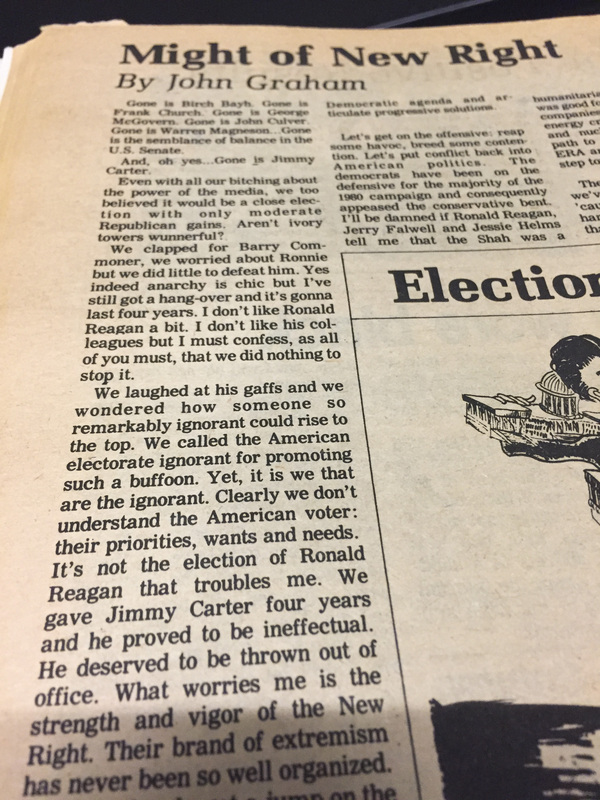 Back in 1980, there were no articles immediately after Reagan’s election that discussed the relevance of race to Reagan’s campaign. Both issues of The Argus are full of people who do not know a way to concretely react and yet clearly felt the urge to put pen to paper—or, now, fingers to keyboards—and express their confused mix of emotions. Some writers offered messages of hope, others messages of loss, and others still messages of both. Dan Bachman ’17 and Graham’s opinion articles reflected on their own guilt with regard to the elections’ results. One concrete reason was cited for both of the Democratic candidates’ failures in the 1980 and 2016 elections, as evidenced in ensuing Argus autopsies. “Carter could not endear himself to anyone,” added Laurence Zuckerman ’81 in her article about Reagan’s election. Zuckerman touched on a factor that was also crucial in both 1980’s and 2016’s elections: the lack of a revolutionary message of change in either Democratic candidate’s platform. Graham went farther, bringing Spiro’s idea of not being “exciting enough” to the entire party. The concern about an unexciting and leaderless left still prevails. As the proverb goes: “Those who cannot remember the past are doomed to repeat it.” Considering that these student writers’ attitudes toward and suggestions for the Democratic party seem largely unchanged from 37 years ago, a history lesson may be in order. On Nov. 6, 1984, Reagan was re-elected for a second term.